View More In Tool Belts. Includes Belt Loop Attachment- One stop shop with the Belt Loop Attachments included for free so you can use your favorite tool belt with ToolsGold Heavy Duty Suspenders. 3" hole to make compatible with most all Tool Belts . Stay Organized with the Hanging loop- has a convenient hanging to hang your suspenders anywhere you would like when not in use. Dont worry about your suspenders getting tangled in any of your other tool equipment. Thick Stitching for added Strength- Don't worry about durability with these suspenders. Reliable to hold excessive weight. Tested Trigger Snap Clips- These clips have been tested for strength and can hold excessive weight (25+ pounds) with out breaking. Unlike other types of clips the special trigger snaps spring cant fall out. 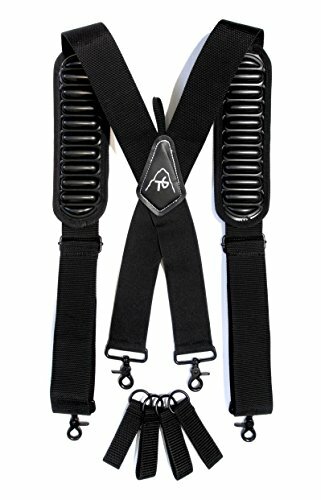 Tough look and Design- The "X" Type of suspenders are designed to take weight off your back and put it on your shoulders so you can have more endurance. Padded and adjustable- Lets face it suspenders aren't always the most comfortable. The bubble air padding allows air to flow through so your shoulders can breathe. The added padding is adjustable with the suspenders size. This way one size fits all. No need to shop around for suspenders that will fit you. STRONGEST CLIPS- New design trigger snap clips tested to hold excessive weight (25+ pounds). 4 SUSPENDER BELT LOOPS -INCLUDED- belt loop attachments to fit with your tool belt. has 3" wide hole for belt. ADJUSTABLE- One size fits all, 2" heavy duty elastic rear straps for added comfort. 2" High Density Nylon on the front for strength and comfort. HANGING LOOP- Conveniently hang your suspenders when not in use. If you have any questions about this product by ToolsGold, contact us by completing and submitting the form below. If you are looking for a specif part number, please include it with your message.